Summers are here again. With the rise in temperature taking proper skin care gets extremely important. Summers can be dreaded for tanning and pigmentation and sunburns. So, don’t let your skin suffer and get tanned. Now, summers could be very well related with sunscreens as a first step towards fighting against the harsh sun and prevent yourself from tanning. Here are some quick tips that may help you protect and combat the harsh sun. Use light water based moisturizer to keep your skin hydrated. Use generous amount of sunscreen to prevent tanning, sunburn and age spots. Use lip balms with some SPF content. Hydrate yourself by drinking enough water frequently. Exfoliate regularly to keep the dead skin away. You may be aware that Nivea recently launched Nivea Daily sun face fluid which is not a cream or lotion that may make you sweat and greasy but it’s a formula that can absorb easily. 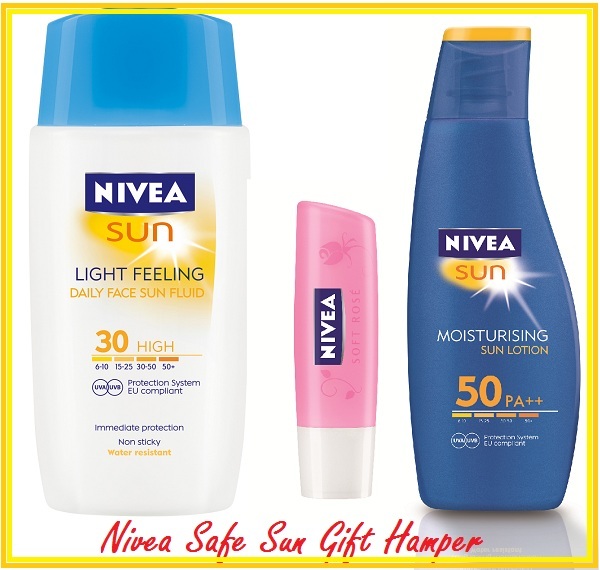 So, here Nivea is giving you a chance to win these goodies. Giveaway will end on 15th April 2013. It is open to Indian Residents. Prizes will e sponsored by Nivea India. You should be atleast 18+ to take part. There would be 3 winners. Participation is very simple all you have to do is fill the easy entries in this Rafflecopter below with few entries only! I know shikha. :) even I cant coming to your blog now. thanks for the useful giveaway for summers. Always use sunscreen if you are leaving the house. The best tip to overcome summer tan is to keep yourself fresh by massaging skin with icecubes every now and then, apply sunscreen whenever you move out and apply lemon juice along with rose water as a face mask once you are back home after a sunny day. my tip "drink lots of water, apply sunscreen not just wen going outside but also wen ur at home"
The most cliche but the most effective way of "summer glow without tan" is to, you know, not get sun on your skin. Generously apply & re-apply sunscreen or sunblock according to your need. And yes, if you're going to be spending a lot of time in the sun, wear long sleeves and carry an umbrella. thanks for nice giveaway..tip is apply sunscreen before goin outside..
Summer tip - Have lots and lots of water. Stay hydrated. sometimes even after applying sunscreen I found tanned face after returning... I would suggest a home made solution that is apply curd on face and hand( tanned area) every time after returning home .. Lemon also works as anti-tanning agent..
Hey Cool Giveaway for this hot summer..
Once you are back from the day out, apply butter milk and lemon juice along with sandal powder. It instantly shows the visible difference on tanned skin.. I did not know about the sun face fluid. Thanks for introducing me to it. And what a coincidence! Just two days ago I was thinking abt the Sun Lotion :) Lovely giveaway. My tip for summer glow without tan is to apply sunscreen/sunblock even when you are inside home because radiations are present even inside. Also, if you have been out in the sun, it actually takes some 7-8 days from the actual sun exposure, for the tanning to start showing. So after-sun care also helps, like applying cucumber juice/ rose water or rubbing ice cubes after coming back from the sun. mix cucumber juice and milk which will act as an cleansing milk to clean face leave it for 15 mins and wash it of with cold water. this will help remove tanning on face also. mix cucumber juice and milk and apply on face leave it for 15 mins then wash off with cold water.This will help in removing tan from skin. Good luck to my Indian friends! Prevent: Use a high SPF sunscreen which has UV protection too. Fortify: Cover your face even with the best of sunscreens as much as you can. Better be safe than tanned. Apply a paste of Curd, Turmeric and Honey on your face. Wait till it dries then wash it off with cold water. Repeat this for a week or more and get back to your normal complexion. My tip for summers would be drink lots of water, apply sunscreen before stepping out.